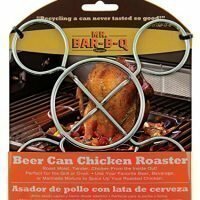 Around here this little barbecue sauce pot is one of our most used grilling gadgets it is perfect for warming and cooking your own sauces right on the grill. Don’t let this barbecue sauce pots small size (it is 10L 5W and 3 inches deep) fool you, it holds plenty of sauce that will cover the vast majority of your grilling needs. 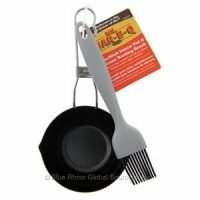 The included silicone basting brush makes even sauce coverage as simple as the cleanup. 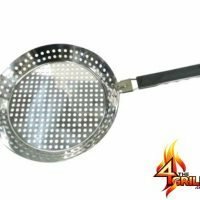 Why use a sauce pot? When cold barbecue sauce is applied to hot foods it needs to warm up for the food to begin absorbing it. This is especially true with chicken skin. This makes the first coat of sauce smear and puddle. When you apply a warm sauce to hot food it sticks to your food almost immediately giving you a nice base coat to work with. If you just need to pour on a sauce when the food is finished. This pot has pouring spouts on both sides of the bowl to help you with that as well. Try some blue berries, bourbon and sugar poured over a piece of grilled angel food cake. 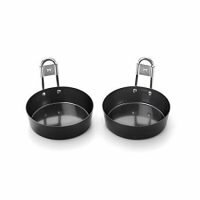 This sauce pot is non-stick coated, that allows it to be cleaned up in seconds with a little soap and water. While this is dishwasher safe we do not recommend it. Harsh dishwasher detergents will eventually scratch the finish. The basting brush that is included is 9 inches long and 1.5 inches wide. It has a plastic handle and silicone bristles. 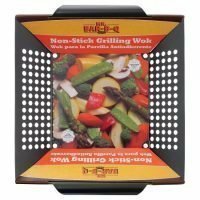 It cleans up easily and can be used in the kitchen as well as out on the grill. 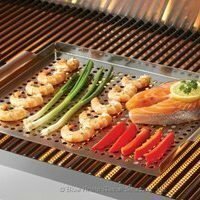 Metal becomes hot when sitting on a hot grill, hand protection should always be used when handling this even for just a second. Trust me on this one I know from experience. We have had one of these sauce pots for years. We love it and use it all the time. 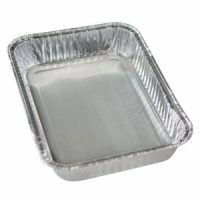 Just fill it with Coney sauce, butter or beans (just to mention a few uses) and park it off to the side of your grill while cooking. Stir it every once in a while and it’s good to go when your food is done. Throughout our blog you will see pictures of it everywhere.